Active in 2009, Democracy fell under the umbrella of Design Event, an initiative established in 2005 in order to support designers across the North of England especially graduates and those at the early-mid stages of their careers; and to provide a platform for the public to engage with good design. The process began with an open call to designers asking them to create work on the theme of democracy. The brief suggested that this could be in the nature of graphic design, illustrative, photographic, typographic, ‘but above all: creative, original and challenging’. It suggested that this was an opportunity ‘to do something new, something non-commercial to test your creative mettle against other designers’. Submissions were then made through the exhibition website which served as a forum for evaluation of the design works by the public. Here, users were able to comment on submissions as well as voting for what should be included in the final exhibition. The 51 pieces of work which received the most votes of 498 submitted were exhibited in a gallery space in Newcastle-upon-Tyne. These took a projected digital form, the size of each determined by the number of votes that it had received. Displayed in this way, visitors to the exhibition were encouraged to interact by voting for their favourite works via mobile phone or paper ballot. Mobile phone votes were reflected in the digital exhibition as artworks were resized in order to reflect their place in the poll. Numbers are an interesting gauge of success in such projects, although a drive for quantity, while important for claims about participation, might serve to qualify suspicions about the quality of the work and responses generated in such circumstances. In this case, Sumo report that, during a four week window for entry to the exhibition, the bespoke Democracy website received 28,542 visits from 14,297 unique visitors, while there were 1,767 individual registrations at the site with 1,262 online comments on the submissions. Of interest here too is the strategy of encouraging those who took part to share their interactions via social media links. As a result, the site received 3,549 visitors from Facebook and 1,448 from Twitter, as well as gaining coverage across design blogs. As mentioned, the online site is still active with a rich Flickr archive which gives a sense of the exhibition. Likewise, there is a publication which captures the creative contributions. For some, of course, this might seem an anachronism for such a digitally-engaged project. 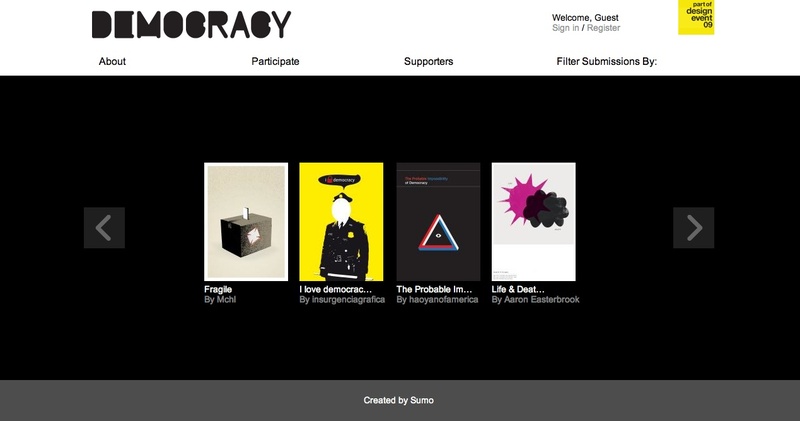 By submitting an artwork to Democracy, you are granting the exhibition organisers (Sumo Design Limited and Design Event) the right to reproduce the work on the internet, in the exhibition, in the Democracy book, in promotional materials and in any press related to Democracy or Design Event. By submitting an artwork to Democracy you are declaring that you are the owner of all rights to this work (and to any photography or imagery contained with it) and that the exhibition and publication of these works do not violate the rights of any third parties. By submitting an artwork to Democracy you agree that you shall not receive any financial compensation for granting the exhibition organisers (Sumo Design Limited and Design Event) these rights. In our evaluation, we’ll certainly reflect a little more on the democratic nature of online projects like this and the extent to which any consideration is given to rights as it is here. There is some discussion to be had about the ways in which benefits are apportioned in such cases. The extent to which any one project is successful, and the terms of its success, will impact upon how participants are likely to feel about those benefits and the balance between exposure and short-term financial return, for instance. Ultimately, one of the important outcomes for all of the stakeholders and participants in Culture Cloud and the wider NESTA initiative will concern whether the success of each project is defined within its own terms and internal dynamics alone or whether each offers a transferrable model and possibilities. By any estimation, Democracy offers a useful yardstick for our evaluation.